Continuing on our quest through legendary game designers we will discuss another multi-talented individual and the mind behind the Prince of Persia series, Jordan Mechner. Pulling triple duty as an author, screenwriter, and game designer, Jordan has been a busy man. 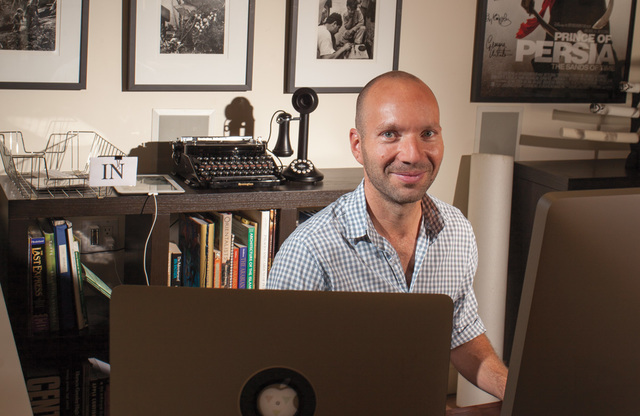 This Yale alumni began his gaming career while still at university. While in school he programmed an Asteroids clone and a game called Deathbounce, neither of which were ever published. Jordan spent a good deal of time on his next project (about 2 years) and his hard work paid off and he published his first game, Karateka, in 1984. The story was set in feudal Japan and your goal was to rescue your girlfriend from the evil karate fighters. Karateka was an interesting endeavor for Jordan in that he was a film student and drew a lot of inspiration from Akira Kurosawa and Disney animation. This is what made him so focused making his character's in-game movements as fluid as possible. In his classes he was learning techniques like cross-cutting, tracking shots, and rotoscoping. Using a video taken of his karate master demonstrating moves, Jordan used rotoscoping to draw over images taken from this footage to create the in-game movements. This was new ground for video games as this was the first time this technique had been used. 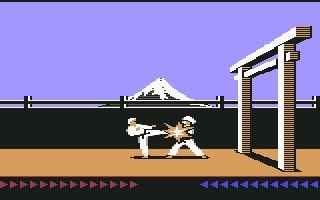 Though Karateka is widely considered one of the earliest fighting games, Jordan prefers to think of it as a game with a story that happens to include fighting in it. 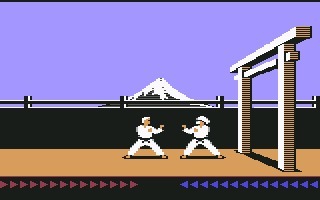 Karateka was so successful it became a number one chart topper on the Billboard software chart. Not a bad way to start a career, I would say. 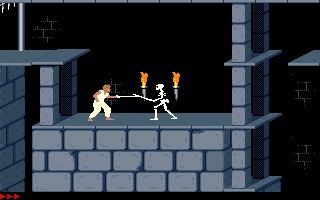 Not long after the success of Karateka, Jordan would create the first in his most famous series, Prince of Persia. He spent 4 years developing it and released it in 1989. 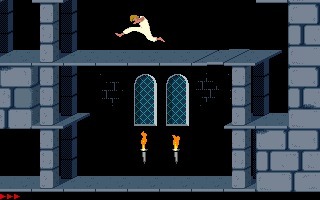 The original Prince of Persia is heralded as the father of the cinematic platformer genre and it used the same rotoscoping technique as Karateka to keep the movements smooth. It took the concept of a platform game to a whole new level and used a more deliberate and careful type of gameplay. The story was set (obviously) in Persia at a time when the throne was vulnerable to the ambitious Grand Vizier as the Sultan was away fighting a war. The Vizier’s goal was to force the Sultan’s daughter to marry him with threats of death, so romantic. Her actual lover is the Prince who’s been thrown in prison. He now has just one hour to escape and stop the wedding. The game must be completed in that hour time frame and gives the game much more of a challenge. At the time of its release, Jordan had programmed PoP for the Apple II, which was headed downhill in popularity. This decline in the platform hurt sales, but after porting it to other platforms the numbers picked up and the game did well. 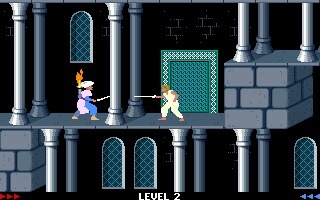 The original Prince of Persia continued to be ported all the way up until 2012. It has also been published in several languages and won multiple awards. I think it goes without saying that he managed to make another hit. By the time Jordan created Prince of Persia 2: The Shadow and The Flame in 1993, he was no longer programming, but was more into game design and mechanics. PoP2 kept the same gameplay concept and the time limit from the first one. This time around there are more enemies and they attack in groups rather than a single enemy at a time. This sequel had more mixed reviews than the first one, mostly due to people complaining about the difficulty. I don’t understand this aversion to a challenge that people seem to have. Difficulty is not a negative for me, just means I get to flex my skills, but that’s just me. 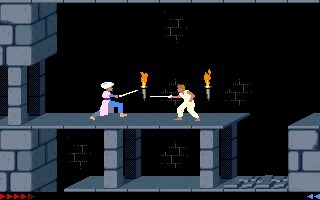 Overall, Prince of Persia 2 didn’t do too badly in comparison to its predecessor and many fans prefer it to the original. 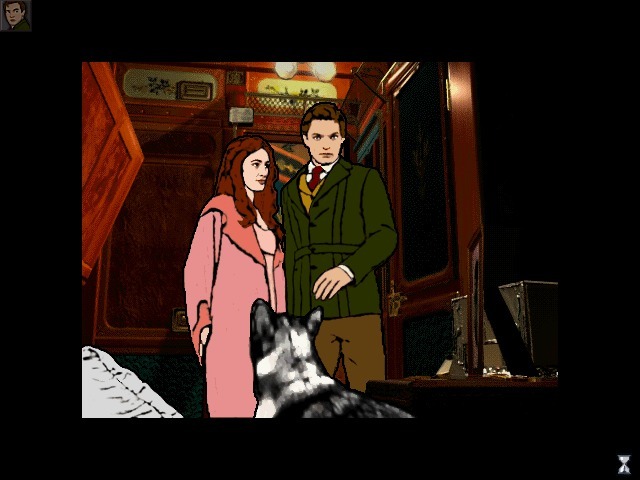 It also got a HD remake in 2013 for mobile devices. In 2001 (after a break from the industry for a while) Jordan was approached by Ubisoft’s founder, Yves Guillemot, about doing a new Prince of Persia game. By this time there were 3 games in the series, Prince of Persia, Prince of Persia 2: The Shadow and The Flame, and Prince of Persia 3D. Prince of Persia 3D was Broderbund’s attempt at reviving the franchise in 1999, but without Jordan the project fell short of the original 2. Due to the lukewarm reception of PoP3D, Jordan knew he had to do something different to bring his franchise back to life and to a new audience. While working on the game Jordan tried to keep from coming to the project full-time, but it rekindled his love of game making and he finally gave in. in 2003 Prince of Persia: The Sands of Time was released. Now, this was actually the first one I played myself. I was in college (actually more around 2007 for me) and my suitemate was obsessed with Sands of Time and she got me playing it. That’s how we eventually bonded and became roommates the following semester, our mutual love of gaming, but I digress. Sands of Time of course expands on the concept of the original Prince of Persia and places it in a 3D world. It keeps the platforming, trap dodging, and enemy fighting intact. The Prince is essentially tricked into unleashing the Sands of Time, which transforms everyone into sand monsters. Now he must undo what he has done and restore the kingdom. This time around he has the Dagger of Time at his disposal and can control time and use magic. Jordan was successful at bringing his game back from the dead as Sands of Time did incredibly well and won multiple awards, including many ‘Game of Year’ titles. It revived the franchise so well it was featured on French postage stamps, which is pretty cool. 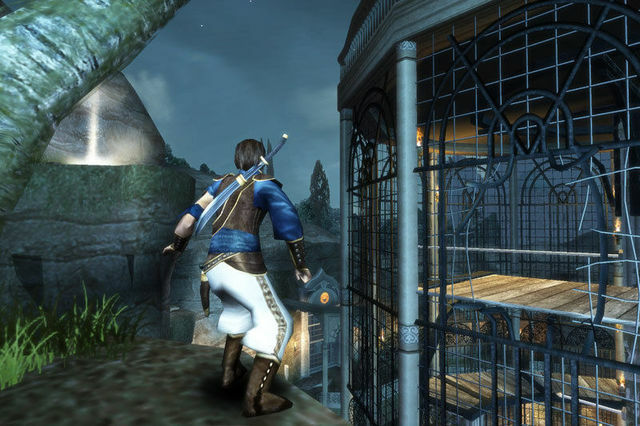 Ubisoft went on to make 4 more Prince of Persia games, expanding the franchise even more. The Prince of Persia series has been an inspiration to many in one form or another. One example is the Prince of Persia Unofficial Website run by a huge PoP fan, Jalal Noureddine. The site is all things PoP, including downloads, trivia, posters, news, etc. I got to talk to Jalal myself, really nice guy actually, about PoP and his website. He told me he was inspired to create his website after rediscovering the diskette version of the first Prince of Persia and playing it again. If you check out his award winning site, you will see that he takes the time to really discover and share some cool stuff. As far as people who have never played Prince of Persia before goes, Jalal says the PC, Mac, and SNES versions are good ones to play. 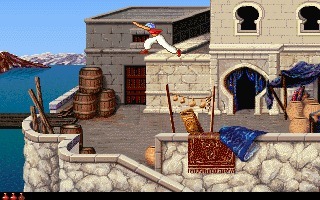 He also recommends 4D Prince of Persia, for a little added challenge. I spoke to him about a few different things regarding his site, but I feel like it would speak for itself better than I could, so I suggest any serious Prince of Persia fans (or anyone for that matter) check it out. Jalal himself is also open contact directly and even invites contributions to content. As well as creating games (and inspiring them), Jordan has also done his fair share of screenwriting for movies including a big screen adaptation of Sands of Time in 2010. The movie is the top-grossing video-game-turned-movie to date and earned more than $335 million at the box office. Jordan also wrote several books and graphic novels related to the PoP series, among other things. I would say Jordan has had a pretty damn successful career. These days Jordan stays busy and you can follow him on just about every social media outlet if you’d like to know what he’s up to. He also seems pretty open to contact directly at his website.